The New South Wales 42 class was a class of diesel locomotives built by Clyde Engineering, Granville for the New South Wales Government Railways in 1955/56. 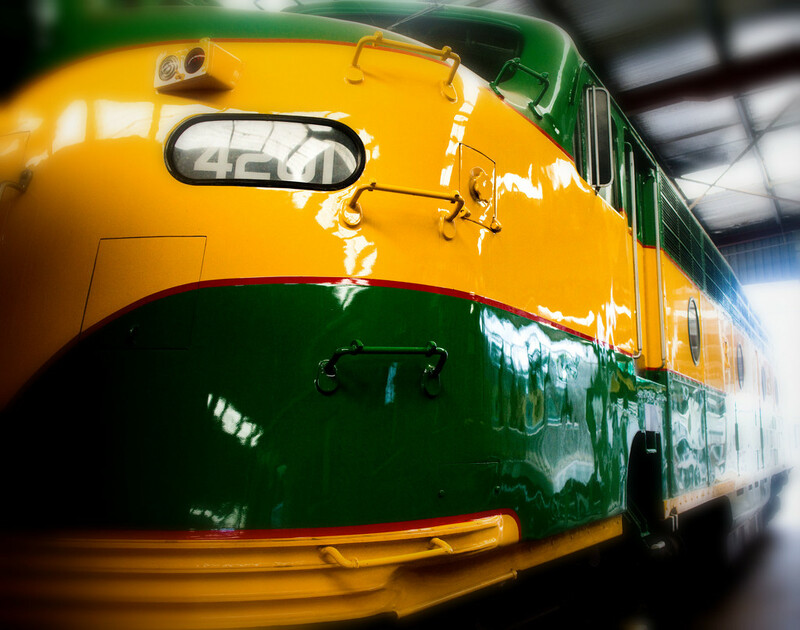 4201 was acquired by the NSW Rail Museum. It has been used extensively on charters across the state and ventured interstate to Melbourne. It retains the green and yellow livery it received for the 125th anniversary of N.S.W railways in 1980. As of April 2018 it was in operational condition. Great shot of this shiny oldtimer. This is a beauty! So shiny and clean. Super shot - so shiny and yellow !! Like this very much - so clean! Bright and shiny, great capture Annie! This is definitely coming right at you! I like how it fades out into brighter light. Somebody must spend a helluva lot of time polishing these wonderful trains. Great shot and train. I like especially your pov in this shot. The low pov is great for bringing out the size of this beast. Love the vibrant colours too. wow that's shiny! lovely DOF too. @annied Ahhh, a woman's work is never done? I think you found a great angle for it. there's not much you can do about the light reflections- but you've just worked with them in this shot and it looks good. Delighted that you were able to talk to a member of staff who was dedicated to her task. I do this too and am always delighted that people are more than happy to tell you about their work and how much they appreciate the recognition. They make my heart sing! I like how close got! Nice colours here too. The reflections give it a lively feel. I love this shiny one!